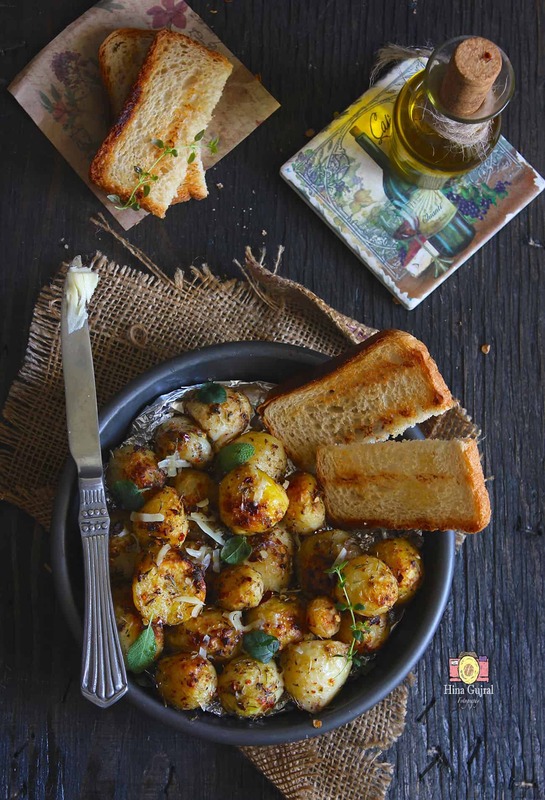 Garlic and Herb Roasted Potato Recipe is the easiest and most delicious way to eat crisp potato bites flavored with lots of garlic and Italian herbs. The fresh herbs and garlic combination is a marriage made in heaven. Though both are strong and over powering flavors still compliment each other well. These roasted potato bites require a marination time of less not more than 30 minutes, which is totally worth it. The marination helps the flavor of herbs and garlic penetrate within the skin of potato and end result is flavorsome, crisp from inside potato bites. No pass around dinner parties in the house is complete without the Garlic and Herb Roasted Potato. By the time guest makes themselves comfortable with a drink or two, roasted potato bites start grilling in the oven filling up the kitchen with the aroma of garlic. A tempting sweet smell engulfs the kitchen air. Making the diners excited about the roasting potatoes in the oven. These roasted potato bites are not only a fantastic finger food but can be served as a dish as well along with the main course of steaks, vegetable casserole bake, and soups. 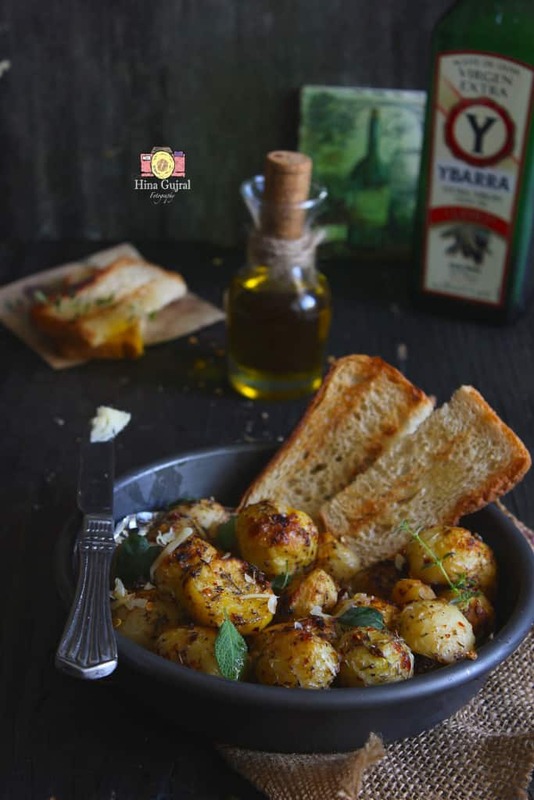 We usually relish the Garlic and Herb Roasted Potato with a slice of toasted bread smeared with soft butter or cheese and a glass of wine, if time permits a quick garden fresh salad on the side makes the meal wholesome. 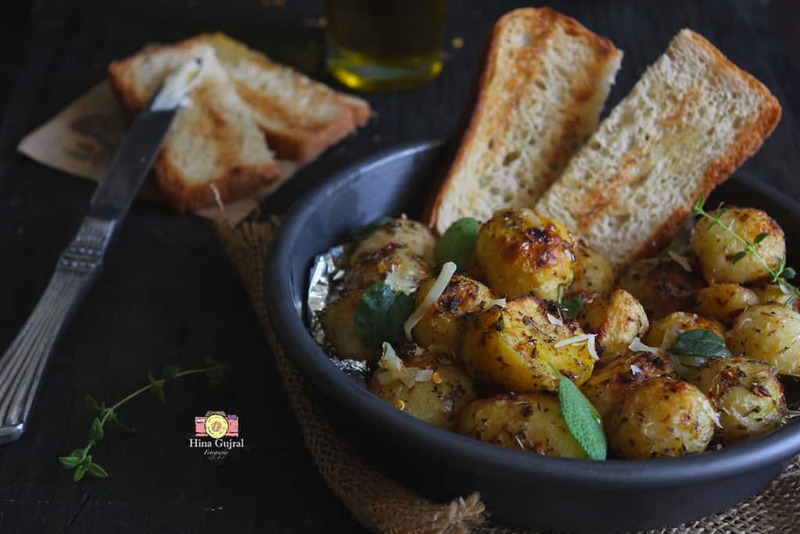 Garlic and Herb Roasted Potato Recipe is the easiest and most delicious way to eat crisp potato bites flavored with lots of garlic and Italian herbs. To prepare the garlic and Herb Roasted Potato, wash the potato in water to get rid of dirt. Wipe them with a kitchen towel. If your prefer, peel the skin. 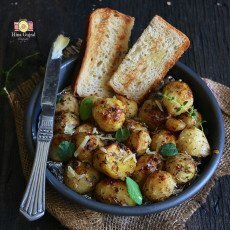 I have used baby potato but you can use regular potato as well for the recipe. Cut the regular size potato into equal size wedges. Now arrange the potato in a microwave safe plate and cook in the microwave for 5 - 10 minutes. This helps potato to absorb the flavor of herbs and potato nicely. Transfer potato in a large mixing bowl (buy it here) and add olive oil, herbs, salt, black pepper and cloves of garlic. Toss the potato in the seasoning mix to evenly coat each piece with the herbs and spices. Let the potato sit in the seasoning mix for 15 - 20 minutes. Meanwhile, preheat your oven (buy it here) at 180'C. Arrange the potatoes in a baking sheet (buy it here). Roast the potato in the oven till cooked through and the outer layer turns crisp. This usually takes 50 - 60 minutes, after interval of 30 minutes turn the tray for even roasting of the potatoes. Serve Garlic and Herb Roasted Potato immediately after roasting with some cheese grated on top. Looks like a yummy gf dish EXCEPT for the toasted bread in the middle of it.